How to Select the Best Hydraulic Log Splitter? It’s important to first note that hydraulic log splitters come in many different shapes and forms. They aren’t just suitable for professionals or those in commercial or industrial fields, they are also suitable for residential use. The hydraulic components of any wood splitter make the task at hand so much easier. In a job where intense arm pressure is generally required, the hydraulic cylinders aim to take this labor on itself. This ultimately removes the hard part of a labor-intensive job such as log splitting. Within this buying guide we will show you several different log splitters with hydraulic components to make log splitting easier. Some are suitable for residential use, whilst others are suitable for commercial or industrial use. Review each product carefully to ensure you find the best hydraulic log splitter for the money. Because there are so many kinds of wood splitters for sale on the market with hydraulic components, you need to have a fair idea of your work type. Do you have a truck load of logs to be split? Or do you have general backyard tree limbs that are trimmed annually? In some cases, a manual log splitting tool may be all you need, and in others, a gas powered splitter is more suitable. Both generally feature hydraulic components to help reduce the manual labor aspect. Regardless of the splitting equipment you choose, you should always maintain a high level of safety. All outdoor log splitting equipment is dangerous and operators shouldn’t get complacent. You should first read the safety manual within the manufacturer’s guide, as well as taking precautions of your own. This could include wearing protective clothing such as boots and gloves, or even wearing a hard hat, glasses and ear protection. The efficiency of the hydraulic log splitter you choose depends on its power type and the operator. Each different log splitter has a cycle time and some are faster than others. In order to make sure your log splitter runs as efficiently as possible, you should also ensure you use the machine as it’s intended. The fastest way to wear down a machine or lose its level of efficiency is by operating it in an unsafe way, or by overloading it. Every hydraulic log splitter is different, and the features vary for each model, brand or manufacturer. Some log splitters feature basic hydraulic components such as cylinders, whilst others run hydraulic lines to another power source such as a log splitter engine or a tractor/excavator engine. Some also have remote controls, whilst others require the operator to run both the engine and the hydraulic components. The best hydraulic log splitter for the money is one that requires minimal operator intervention and is for sale at a reasonable price in comparison to its features. Maintenance required by log splitting equipment with hydraulic components can be rather complex, unless it’s manually powered. Not only do you have to ensure you maintain the engine components, but you have to make sure the hydraulic parts are well cared for as well. This can include ensuring the hydraulic cylinders aren’t leaking, the fluids are topped up, and the lines aren’t perished or split. Each machine requires different maintenance to be carried out. That’s why it’s important you refer to your manufacturer’s manual for all maintenance and operational advice. Clearing the machine of debris. Topping up all fluids, oils and fuels. Ensuring all moving parts are well lubricated. Checking for cracks, imperfections or breakages in any parts or guards. Keeping the splitting wedge sharp. If you’re looking for a top rated log splitter but you want to keep costs low, the best place to shop is online. Amazon is a good example of a platform which provides plenty of well-priced products where customers often get the best deal. It’s important, however, that you don’t always go for the splitter with the smallest price tag. Look at its features and weigh them up in comparison to the price. There are so many options available and not all are as well-priced as they seem. It’s portable and has an extended tongue to fit most ATV and UTV hitches. It can achieve 300 cycles per hour. It has dual log catchers. It can handle large logs. You receive free lifetime technical support when you purchase it. While it can handle logs of up to 100 pounds in weight, the racks on either side of the splitter don’t appear to be that strong. Assembly can be quite complex. 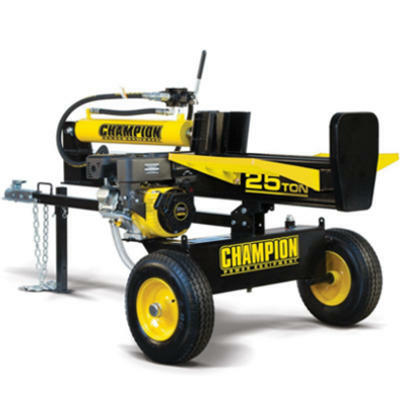 Champion Power Equipment log splitter. Dimensions: 71.3 x 28.3 x 19.1 inches. Power Source: Gas powered, hydraulic. QHow much hydraulic fluid does it hold? If you’re looking for the best hydraulic log splitter for the money that’s also top rated on the market, this Champion Power Equipment log splitter is a good option. It’s gas powered for optimum power, and has hydraulic components to make the splitting process so much smoother. It’s also small and compact to be perfect for both residential or professional use. The best part is, you get it for an extremely competitive price when you buy online. It’s clear to see this log splitting machine is one of the best hydraulic log splitters for the money. Check out what other people who purchased this product think about it. Read Champion Power Equipment hydraulic log splitter reviews. Even though it’s manual, it has hydraulic components to make it easier to split wood. It has 10 tons of force which is ample for a homeowner. It comes with a log cradle. It can’t split as many logs as a gas powered splitter with hydraulics can. Dimensions: 11.8 x 8.12 x 41.12 inches. Power Source: Manual with hydraulic. QWhat is the hydraulic cylinder capacity? A0.17 gallons of hydraulic fluid. QWhat is the hydraulic pump’s power? 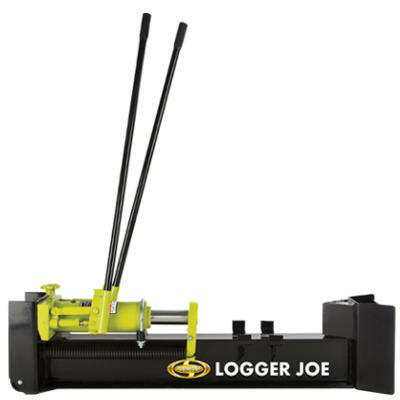 If you’re looking for something that requires less maintenance than an engine powered log splitter, this Sun Joe splitter could be a very good option for you. With just a quick wipe down and hydraulic fluid top-up required, there’s very little you need to do with this splitter. The benefits don’t end there either. Aside from being exceptionally cost effective and low maintenance, it can split wood with surprising results. It can easily take care of logs of 18 x 8 inches in size, and does so without much effort from the operator. It’s an excellent option for residential users, and those looking to split small lots of wood from time to time. Overall, it’s one of the best hydraulic powered log splitters for the money. Check out what other people who purchased this product think about it. Read Sun Joe LJ10M hydraulic log splitter reviews. It can be used indoors and outdoors as it doesn’t run on gas. It’s easy to transport from one location to another. It has a powerful 2HP motor. It’s quite affordable for a range of buyers. It doesn’t have as much splitting force as several other log splitting tools on the market. Dimensions: 18 x 11.5 x 37.5 inches. Splitting Wedge: 4.5 inch wedge. QHow much hydraulic fluid does it require? QWhat extension cord does it require? AMaximum of a 50 inch, 12 gauge extension cord. If you’re not quite ready to trade your heavy duty log splitter in for an axe, this WEN log splitter can most certainly meet you in the middle. Not only can it produce plenty of power in comparison to other electric log splitters on the market, but it also features hydraulic cylinders to make the process less labor-intensive. Being electric, it also requires minimal maintenance and can be used both indoors and outdoors. It does lack driving force, but it makes up for this with affordability, durability and general ease of use. For these reasons alone, it’s easily one of the best hydraulic log splitters for the money. Check out what other people who purchased this product think about it. Read WEN 56206 hydraulic log splitter reviews. 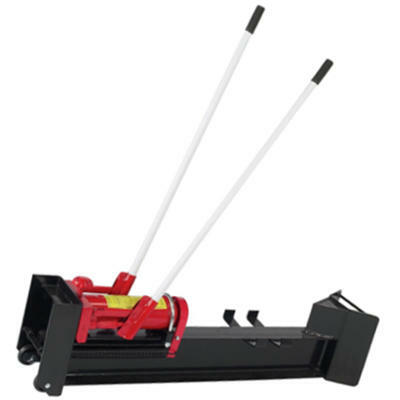 It’s relatively powerful in relation to manual log splitters without hydraulic components. It can split large logs with ease. The log size capacity is very specific which may require more log preparation. The handles are of poor quality which means they can break with standard force applied. Dimensions: 59 x 29 x 24.5 inches. Splitting Force: 5 inch wedge. A13.5 – 18 x 6.5 inches. QHow powerful are the hydraulic components? A2-speed pump to build up 10 tons of force. With a cycle time comparable to that of a gas powered log splitter, consumers are bound to be impressed by this Wel-Bilt log splitter. It works fast, it splits well, and it’s also easy to transport. These features coupled with its highly competitive price tag and lack of maintenance requirements make it a recipe for success. It’s certainly a good alternative to an engine-run log splitting tool and is one of the best hydraulic log splitters for the money. Check out what other people who purchased this product think about it. Read Wel-Bilt hydraulic log splitter reviews. It can be towed at quite high speeds. It can produce 50 tons of force which is quite substantial in comparison to some other makes and models on the market. It’s portable and easy to transport in many situations. It’s quite expensive in comparison to other options for sale. Its splitting capacity is not as good as some other pieces of splitting equipment. Even though it’s advertised as being heavy duty and has a price tag to reflect it, it still only comes with a 1 year warranty. Power Source: Gas with hydraulic. QWhat is the maximum cutting length? QWhat is its maximum towing speed? Advertised as a log splitter which can handle the daily pressure of commercial use, it has a price tag to reflect just that. However, this hydraulic powered log splitter with a gas engine is comparable to many log splitters suitable for residential use as well. It has a good 50 ton splitting force, but it has a reduced splitting capacity. It tows very well, but it’s not superior in its efficiency to those splitters actually targeted towards residential users. Check out what other people who purchased this product think about it. Read Samson Machinery hydraulic log splitter reviews. Where to Buy Hydraulic Log Splitters? 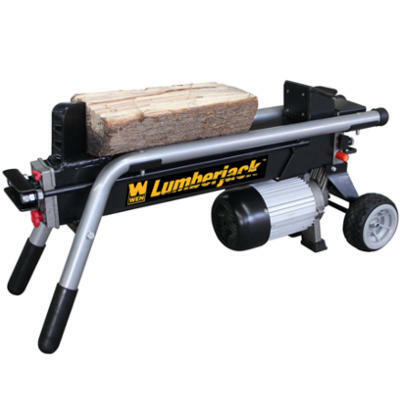 Traditionally, the only way to buy hydraulic log splitters was to head into a physical store. For some people, this was inconvenient and meant, in some cases, you spent more than you intended to. Now, you can purchase hydraulic log splitters online. This means you can review several different options in order to make an educated purchasing decision.